Know any kids who have a tendency to say mean or unthoughtful things to their peers on occasion? Familiar with any siblings who just HAVE to get out that zinger of a stinger, as if putting the other down builds him or her up? If your frustration is building because of the constant verbal jabs flying around you, then you might be interested in something I stumbled upon; one simple concept (a bucket) that might just be your lifesaver! 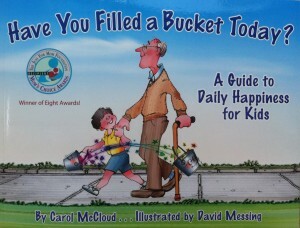 The concept comes from the best-selling children’s book, “Have you Filled a Bucket Today? A Guide to Daily Happiness for Kids.” Don’t let the kid part fool you – they say this book is for ages 4-9, but truly this book is for EVERYBODY. It’s easy to understand, simple to do, and it really works! In my current chaotic, busy life, that is music to this Zen Mama Wannabe’s ears.